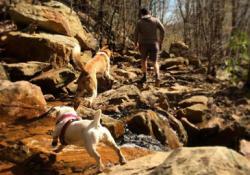 A great place to ease yourself and your dog into running in the Chattanooga area is the Guild Hardy Trail on Lookout Mountain, starting from Ochs Highway, Ruby Falls, or Cravens House. The Guild Hardy Trail is an old railroad bed dating back to the 1880’s so the path is wide and the climb gentle. Adventurous runners and hikers can make longer, more technical loops with steeper ascents on the adjoining singletrack trails. 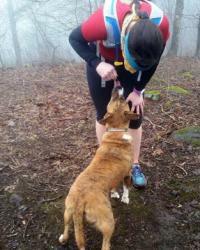 “I love running with my dog on the Guild, Gum Springs, and Rifle Pits trails on Lookout,” says Cynthia Fallowfield. Fresh water can be sparse on Lookout so carry extra for your pup, especially in summer. Unlike sweaty humans, dogs rely on panting to release heat. Regular water breaks will give you a chance to assess their condition as you both cool off. Water is often a deciding factor in whether a trail is a dog favorite. Blane Andrews agrees that the trails near Cravens House are convenient for both long and short runs. But afterwards, his dogs Willow and Dallas are always eager to stop by Glen Falls for a swim. “The dogs and I like to go to places with lots of natural water sources,” Andrews says. The North Chick Gorge is another favorite. “Willow likes to skip all the nonsense going on at the Blue Hole, and go a couple of more miles in for the less populated watering holes,” she says. Her dog Hank regularly runs the Rock Creek and Soddy Gorge sections, but his favorite is the rugged and spectacular Possum Creek segment, where water is plentiful. “The creeks are fabulous!” Campbell says. 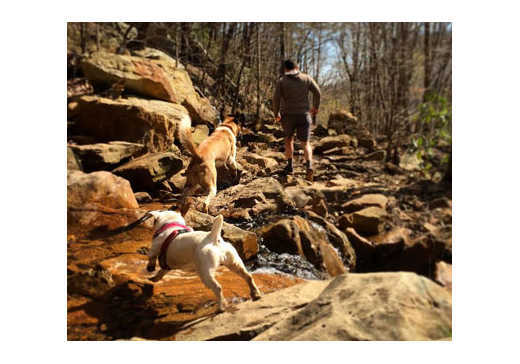 If you value solitude, beauty, and aerobic challenge over having a five bar cell signal, you and your pup will enjoy exploring just about any section of the Cumberland Trail. 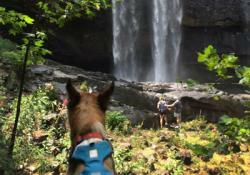 Dreama and Hank also recommend Savage Gulf, Foster Falls, and the ten mile Mullens Cove Loop in Prentice Cooper. Crystal Lee Watson runs often with her dog Harper at White Oak Mountain in Collegedale, Enterprise South, and Lookout Mountain. Clearly, we are blessed (or just doggone smart) to live in an area with so many options for canines and humans alike. So I’m sitting at my desk, wondering what became of that abandoned pup in Atlanta, and our family dog Shylo is suddenly at my side. Her big eyes look up at me, tail wagging madly. Her ears perk for the slightest hint I might offer. You know what? She’s absolutely right: I need turn off the computer and get outside. Note: Remember to pack that leash. Many destinations require one, either by posted regulation or common sense, so have a leash ready whenever you expect frequent interactions with other animals, automobiles, or people.